Can I ask you a question? Please look at your hands! Probably you will notice that you have 5 fingers on each hand. Have you ever been wondering about why you have 5 fingers on each hand? Maybe you are thinking: "coincidence???" Within the group of the mammals humans are classified in the group of the anthropoids. When one compares the hands of the various anthropoids, one will notice that the human thumb is relatively long: only the human thumb researches beyond the start of the index finger. In the other antropoids the thumb is relatively short, which implicates that from an anatomic point of view the other antropoids are not able to bring the of the thumb in contact with the tip of the index finger. 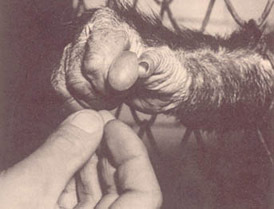 On the contrary human beings are able to oppose the thumb to the index finger in order to perform the so-called 'precision grip'. From the motorical point of view this ability to perform the 'precision grip' is the key-factor behind the fact that human beings have reached the highest position in the race of nature. In the section the function of the hand is pointed out that beside thumb and fingers, the dermatoglyphics and nails have an important role as well in the grip function of the hand. The role of the palmar lines appears to be a mystery: the origins are not understand yet! 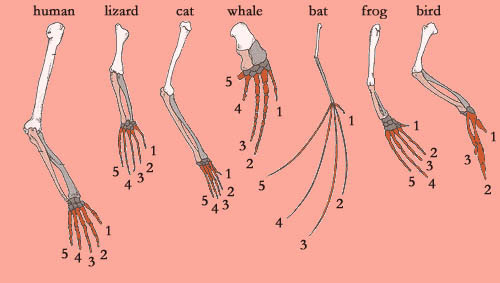 In the section male-female differences various gender related hand differences are examined in the perspective of evolution. 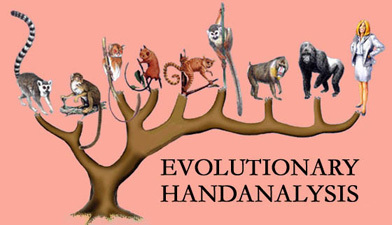 On the basis of evolutionary handanalysis one can conclude that the physical evolution of men is positioned nearer to the ape, compared to the physical evolution of women! And in the section left-handed the attention is focussed on several fundamental differences between the right- and left hand. In left-handed people these differences appear to have evolved differently compared to right-handed people! How come that the most important functional aspects of the hand reveal reliable information about our health? The section Medical handanalysis describes that according medical science anno 2008 only some functional aspects of the hand (more specific: the fingers, dermatoglyphics and nails) can be used as an indicator for specific medical problems. "The signal change in human evolution was due to the upright gait. When man lifted his hands from the ground they were freed from the purpose of locomotion and were put into the service of intelligence."